A caravan is a lightweight trailer that contains the facilities for living. Typically weighing between half a tonne and a couple of tonnes, they are a way of seeing New Zealand without having to spend much on accommodation. Being high-sided and lightweight they are susceptible to side winds and if you happen to be caught by a gust, particularly if you are already turning, it can turn the caravan over on its side. The same applies to any trailer. You can only tow one trailer at a time, i.e. you can’t also attach another trailer to your caravan. Your caravan must have registration and current warrant of fitness. If you already own a vehicle and you are looking for a caravan you will need to check what the maximum towing capacity of your vehicle is. There is a maximum unbraked towing capacity of 750kg, but if the caravan has its own brakes then the towing capacity will be as high as 3500kg. There’s more information about this in our complete guide to towing a trailer, including weight calculations. 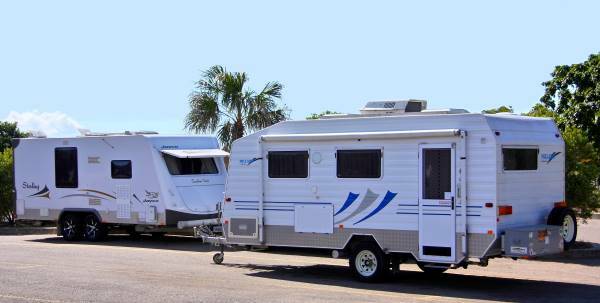 If you already have a caravan and are looking for a vehicle you will need to check the vehicle’s towing capacity. If it doesn’t have a tow bar fitted, budget for the purchase and installation of the bar or tow hitch. Consider the power-to-weight ratio of your car. On flat roads a small car can easily tow a large caravan, but you’ll soon find out that a small engine means low torque and you will lose speed quickly on hills, and if there is a headwind. A diesel engine will have more torque than a petrol engine and, depending on where you feel you’re most likely to go caravanning, a diesel SUV with optional 4WD could offer the best option as it gives you the ability to get further off-road and, if you are parking on wet grass, means you are less likely to become stuck. Bear in mind that the empty weight of the caravan will be lighter than its weight when you’ve loaded it with a gas bottle and your equipment for your holiday. Allow 150kg for the basic items for two people. It’s better to carry heavier items in your car if possible. The weight of the caravan should be on a plate mounted near the door. Locate your heavier items in the middle of the caravan, just in front of the axle. You want to try to maintain a bit of downwards pressure on the tow ball (nose weight) – approximately 5-7% of the weight of the caravan. Check that you are not exceeding the maximum nose weight of the tow ball or tow hitch by using a set of bathroom scales and a block of wood to measure the weight. The wood needs to be approximately the same height as the towing drawbar off the ground. If you want to import a caravan from overseas you must check that it fits within the maximum New Zealand dimensions. In New Zealand your car plus the caravan must not exceed 22m long, your caravan including the drawbar must not exceed 12.5m long and your vehicle and the caravan must not be more than 2.5m wide. It must not be more than 4.25m tall. There must be no more than 4m from the rear axle (or the centre of a twin rear axle) to the back of the caravan. If your vehicle is more than 11.5m long (including any load) then you are not allowed to tow a trailer or another vehicle, and there are other dimension restrictions, too, described in this diagram below. You can tow any trailer on a class 1 learner or restricted licence as long as the total combined weight of your vehicle, its trailer and its load doesn’t exceed 4500kg. When you have your full licence the gross combined weight can be up to 6000kg. A caravan will significantly alter how your car responds under braking, accelerating and cornering. You will need to anticipate and observe what’s happening on the road much further ahead. Novice drivers should not tow a caravan that weighs more than 85% of the weight of the car; experienced drivers should not tow a caravan that weighs more than 100% of the weight of the car. Your caravan could be up to 2.5m wide (the maximum width of a vehicle or trailer on a road in New Zealand without an over-dimension permit). You will need to take a wider line around corners so that you don’t clip kerbs, roadside furniture and roundabouts. Take particular care when coming in to refuel at a petrol pump as you may need to park further away from the pump than usual. Use a spotter or guide standing behind and to the side of the caravan when you are reversing. You may need to get wing mirror extenders to see around your caravan, and this will also make it much easier when changing lanes and overtaking. The maximum speed when towing a caravan is 90kph in a 100kph zone. Leave at least a 4-second gap between you and the vehicle in front because your car will take longer to stop when it’s towing a caravan. Start your braking earlier when coming up to corners and intersections. The caravan will be exerting a force on your tow ball trying to push the car forwards, including when you are driving around a corner. This extra stress on the tyres means your cornering speeds should be less so that you don’t risk jack-knifing. When your caravan is unladen it is likely to bounce around a lot on bumpy roads, therefore take it easy on the speed. Make sure items that could move around are secured and that your cupboards and drawers are latched shut. On a long downhill stretch use your gears to help slow the car down otherwise you are at more risk of brake fade. When overtaking other road users give a much wider berth. Your caravan will be wider than your car. For cyclists this is especially important as they will also be subject to the extra turbulence your caravan creates. Remember that you have extra length, so don’t pull in too early. People are not allowed to travel in a caravan because caravans have no seat restraints and minimal crash protection. If you drive too fast for the caravan or if there is a strong side wind or turbulence then you can get snaking or pitching where the caravan swings from side to side. The only practical way to stop this is by slowing down. If your vehicle is fitted with trailer sway assistance it will use the electronic stability control to help bring the caravan under control. Your travel times will be longer because you won’t be able to drive as fast and you will have much less overtaking opportunities. You will need to pull over and let other faster drivers pass you. Expect to stop more frequently because towing a caravan is more tiring mentally than just driving a car. You will use more fuel than usual because of the weight of the caravan. Occasionally you will see specific caravan parking marked, but it’s uncommon. Remember that you are not allowed to freedom camp in many places in New Zealand. When parking, find a flat, firm are of ground preferably not facing uphill because that will make it harder for you to move away, particularly if it’s rained overnight. Engage the handbrake and wind down the legs and the front jockey wheel. Place chocks around the wheels and then plug in any on-site power. Reverse this process when leaving the campsite. Of course, the parking of the caravan is the purpose of towing a caravan: so you can enjoy your holiday. Take advantage of the tips above and have a safe journey towing your caravan. For more information and list of caravan sites and dump sites check the NZMCA’s website.